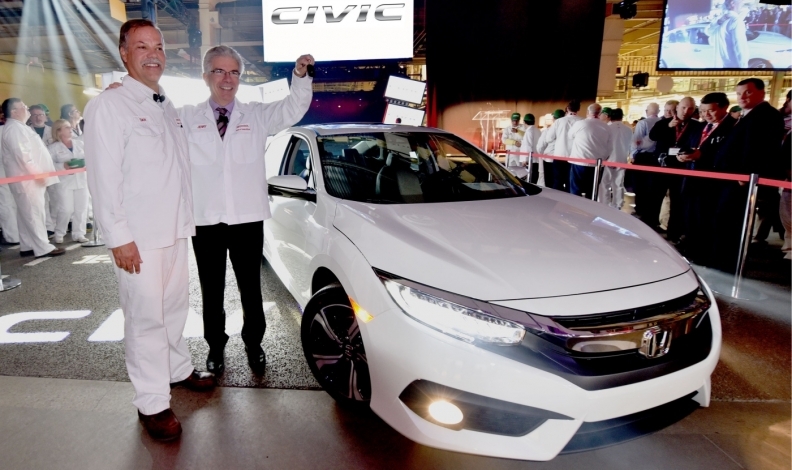 Honda of Canada's Alliston, Ont., plant is the global lead plant for the Honda Civic. Growth of employment in Japanese-brand and Japanese-owned automotive firms in Canada has far outpaced growth in the country’s automotive industry itself, according to a new report. At the request of the Japan Automobile Manufacturers Association of Canada, McMaster University professors Greig Mordue and Brendan Sweeney studied the economic impact of Japanese auto investment in Canada between 2001 and 2016. They found that Japanese-brand light vehicle production represented 44 per cent of total light vehicle production in Canada in 2016, nearly a twofold increase from 23 per cent in 2001. The number of people employed by Japan-based firms across the industry has also more than doubled. Sweeney said overall vehicle production in Canada is down about 35 per cent since 2001 while total OEM and auto parts employment are both down about 40 per cent during that time. “This report illustrates the extent to which the shape of the Canadian auto industry has changed in the post-NAFTA era,” The Japan Automobile Manufacturers Association of Canada says on its website. “As in the U.S. and Mexico, investment in Canada by offshore headquartered companies has grown significantly, resulting in benefits for local suppliers, but also leading to new investment in parts manufacturing. The association represents Honda, Toyota, Nissan, Mitsubishi, Mazda, Subaru, TMMC and Hino in Canada. While the Detroit Three have moved production out of Canada or cut jobs, Toyota and Honda have either maintained production or added to it over the past 15 years. However, the study also notes that Japanese OEMs don’t have as much casting, engine, and powertrain production capacity in Canada as other OEMs. “The proportional increase is the result of increased production capacity at Japanese-brand vehicle assembly plants combined with reduced total production capacity in Canada overall,” reads the report. Annual production of Japanese-brand light vehicles in Canada surpassed one million units for the first time in 2016. Toyota produced more than 600,000 units at its assembly plants in Cambridge and Woodstock, Ont., and Honda produced more than 400,000 units at its assembly plants in Alliston, Ont. Meanwhile, Medium-duty truck manufacturer Hino, in operation since 2006, also produced more than 2,000 units at its assembly plant in Woodstock. “This represents the third straight year in which Japanese-brand vehicle production in Canada increased, and the tenth year-over-year increase since 2001,” reads the report. In 2016, Japanese OEMs employed 35 per cent of the automotive OEM workforce. In the same year, Japanese-owned firms employed 20 per cent of Canada’s automotive parts manufacturing workforce. In fact, Japan-based auto-parts makers in Canada now employ more people than U.S-based parts makers, the study found. Japanese-branded and Japanese-owned vehicle assembly plants, automotive parts and tire manufacturing establishments, new vehicle dealerships, and national and regional sales and administrative offices directly employed 85,678 people in 2016, an increase of 35,011 (69.1 per cent) over 2001. Neither Sweeney, the report's author, or David Worts of the Japan Automobile Manufacturers Association of Canada could be reached for comment.